Your Countertop – ok or SPECTACULAR? 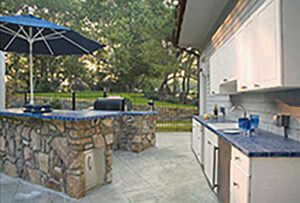 Your countertop – the finishing touch to your outdoor kitchen. Will it be super-elegant granite with multiple beveled edges? Colorful tile with a fanciful design? You’ll find there are many materials to choose from. People want to personalize their outdoor kitchens by choosing a countertop that not only expresses their own sense of style, but will complement the already existing colors of their outdoor decor and their home’s exterior. Location may also play a part in your countertop choice. In the Southwest, it’s not unusual for colorful tile to be used, reflecting the history of the area. In urban areas, custom-poured concrete countertops can echo a modern, industrial feel. Other surfaces are also available, including an engineered stone product, often referred to as quartz, which is a material made from quartz crystals held together with a resin binder. This product looks similar to natural stone, but has a much more uniform look. It’s very durable, non-porous, and comes in many colors. Of course, granite is always a perfect choice, and choosing it is a lot of fun. You can go to the granite yard and pick out the slab yourself. With the extensive color palette and exquisite grain of granites, it’s almost impossible pick only one. And it’s amazing when you see that raw slab of granite you chose fabricated into a beautiful countertop. Hard to believe that it was just a piece of stone before you picked it! Choosing the perfect piece of granite is a lot like shopping for the perfect wedding dress – you’re not exactly sure what you’re looking for, but you always know it when you see it. countertops with edges that are rough, or “chiseled” are gaining in popularity. They convey a feeling of expensive luxury, and are new enough that they’re real attention getters. 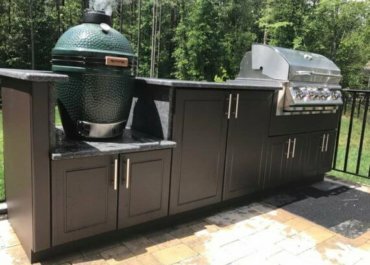 This look adds a little extra “custom” to your custom outdoor kitchen. If you choose the rough-edged look, be aware that rough granite edges and clothing don’t play well together. Before you snag or ruin a favorite top, remember that you’ll need a barrier between your clothing and the rough edges. When working at your counter, you’ll probably already have a dish towel handy. Just place it between you and the counter edge. Lean on it so it stays put. It’s a win-win situation. You’ll have snag-free clothing and a dish towel ready when you need it.